RUGBY: The 20th anniversary Aussie Bar Phuket International Rugby 10s will kick off next Friday (May 25) at Thanyapura Sports Club with teams from Australia, Hong Kong, Japan, the Middle East and of course home town favourite the Phuket Viagrabonds hoping to take home the cup in the Athena Siam Coffin Dodgers Vets tournament for the over 35s. As many of the regular teams have aged, the organisers have introduced the One Foot in the Grave tournament for the over 45s so they can continue playing in the tournament and enjoying the rugby with their silky skills and never say die attitudes. Saturday May 26 will see the start of the main tournament with 16 teams battling it out in the men’s division for the Maria Memorial Trophy and four ladies teams bringing some hard hitting action and a touch of glamour to the event. 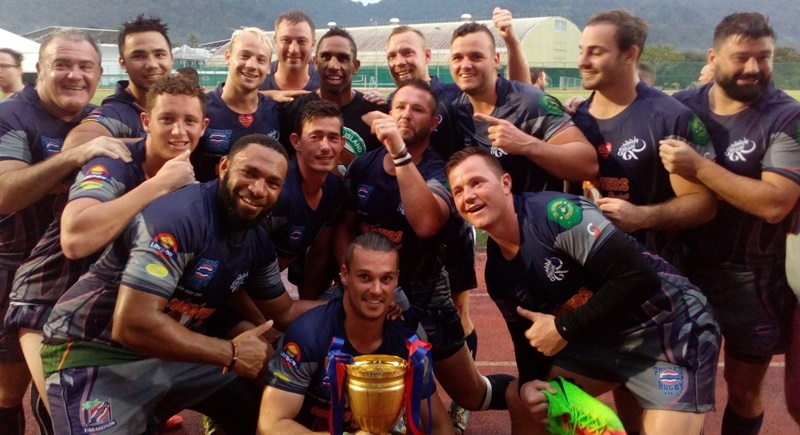 Reigning champions The Phuket Vagabonds are hoping to go back-to-back and again take the honours come the finals next Sunday (May 27). There will be some tough opposition again this year with last year’s runners-up the Asian Japanese Dragons aiming to go a step further. Serious challenges will also come from the Headhunter Sport Barbarians, Gold Coast Barbarians and Jakarta Komodo Dragons. The Bedok Kings, Old Man Mix, Beaver Nomads, Naughty Nuris Vagabonds, Prince of Songkla Rugby, Pattaya Panthers, Melanins RFC and the Singapore Wanderers will all have a say in the outcome come Sundays finals. There will be some social events with the Aussie Bar on Bangla Rd the venue for the vets meet and great on Thursday evening (May 24) from 7:30pm, at Naughty Nuris in the Forest on Friday for the open tournament get together from 7:30pm and the Tour Virgin Beauty Pageant at Tai Pan from 8pm on Saturday. Entry is free for spectators so come on down and support your teams and enjoying some quality international rugby 10s.